Chicago has lost another chess personality. Ronald “Ron” Washington, 61, died on Friday, July 27th after being pulled from Lake Michigan fully clothed in an apparent drowning. Washington was apparently swept into the water and caught in a rip current. 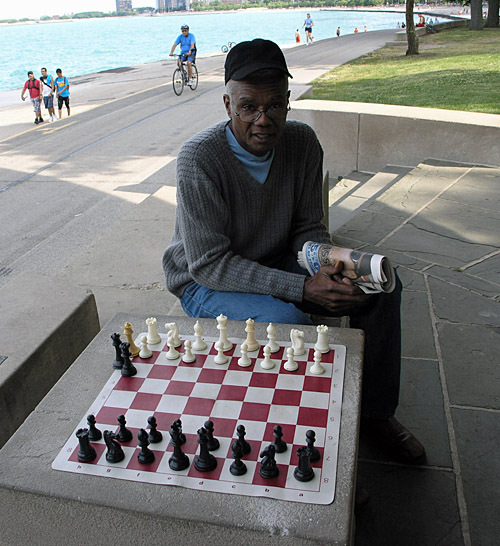 He was found a few hundred feet from the North Avenue Beach’s “Chess Pavilion” where he spent the better part of 20 years taking on all comers. According to news reports, Washington was pulled from the lake near North Avenue Beach at Burton Place at 1:45pm, officials said. He was rushed to Northwestern Memorial Hospital in “very critical” condition where he was later pronounced dead. The news of his sudden death came as a shock since he was apparently in good spirits. The death was reported in the Chicago area news and ruled as accidental. No further details were given about his death. Another person was pulled from the lake the same day, but survived. Ron was playing Black in a tournament game against Ed Perlmutter. The game went 1.d4 Nf6 2.c4 e6 3.Nf3 Bb4+ 4.Bd2 Ke7??? 5.Bxb4+ Kxb4!?! At this point Ed of course pointed out that the piece on b4 was Ron’s king!! Poor Ron had such a hangdog expression that Ed very kindly let him substitute the intended 4…Qe7 and continue the game. Ed managed to eventually win anyway. 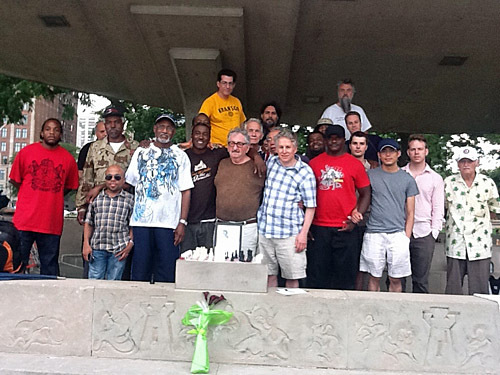 To Chicagoland chess players, Ron was a familiar face in chess circles. While Ron did not always approve of the term “hustler,” he admitted that the games he played were for small stakes and stated jokingly that he has been able to get all of the money back that he had lost in chess over the years. If one questions why a 61-year old man would spend his life playing pickup games on the beach, Ron would have an answer for them. In life you gotta do what you like doing otherwise life is not worth living. What the hell you’re going to do… go home and watch TV? Everybody does that. You gotta do what you like doing. You’ll get out of bed. If you like doing it, you’ll get out of bed. If you don’t like doing it, you’ll stay at home. You’ll say, ‘I’m not going to work today’… because you don’t like what you’re doing. Once you enjoy your work, everything else works. Yeah. That’s how I look at it. To me, Chess Pavilion is a great place to be… for those who want to come. This is kind of life I want to live… so it depends on what you like in life. 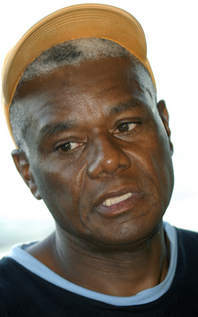 He was the subject of a news story done back in 2007 by the Chicago Reader’s Ted Cox. In the story, Ron intimates that he began playing sometime before the “Fischer Boom” in the 70s. He quipped that he couldn’t wait on the Fischer Boom to start playing! He actually learned chess from his barber at age 14 in Louisiana. Cox’s story gives a candid look at Ron’s good-hearted nature. Ron was a tall and stately-looking man with a full crown of gray hair. He had aged gracefully. Many may recall Ron’s affable personality and his hearty laugh. This was depicted perfectly in this documentary done on him in 2010. I think it was at 1024 N. State in Chicago. The first tournament I won (as I recall, I tied for first at 4-1 in the under-1800 section when I was still rated 1500-something) was at his place, I think in 1975 when I was almost 15. He also had great round-robin 5-minute tournaments there every week, where I played players like three-time Wisconsin State Champion Charles Weldon and Judge George Leighton (still going strong at 99). I also tried hustling players there in the summer of 1977, without much success. The prospective marks threw nickels around like they were manhole covers. But one memorable 3-minute game from that summer went 1.d4 Nf6 2.Nc3 d5 3.Bg5 c5 4.Bxf6 exf6 5.dxc5 d4 6.Ne4 Bf5 7.Ng3? Bxc5! 8.Nxf5 Qa5+ 9.c3 dxc3 10.b4 Bxb4 11.Qc2 Qxf5! 12.Qxf5 d2#! Ron’s shop eventually went under, unfortunately, like so many other Chicago chess venues. According to David Franklin, there had been a small memorial one day after his death. 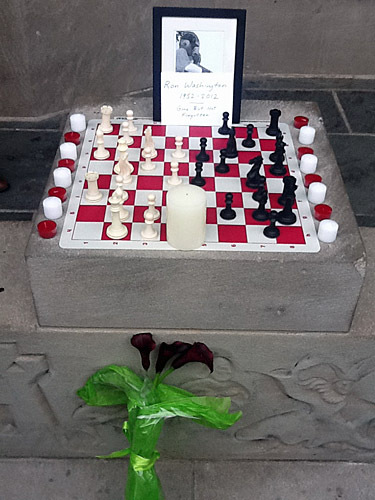 In his memory, the entire chess community will be holding a memorial on Friday, August 3rd, at 5:00pm, at the North Avenue Beach Chess Pavilion. There will certainly be a lot of stories shared. Ron’s presence at the Chess Pavilion will be sorely missed. Ron Washington’s friends pay him a tribute at the Chess Pavilion. Ron’s board and a position of his beloved English Opening. Photos courtesy of David Franklin. Ron Washington at the Pavilion on June 14th, 2012… one of the last photos of him. I had first met Ron as an up-and-coming junior and played him in a hotly-contested blitz match. I earned his respect, but he did not remember me after so many years. We reminisced on old times and caught up on Chicago area players. I asked to take a picture of him before I left. As I left, he urged me to come back and see him. My sister, who was with me, stated, “He seems like a nice man.” Never knew I was saying goodbye… you never know. He played 1.c4 almost religiously and tinkered with the Accelerated Dragon. Here is a video of him play blitz. Not sure who the video belongs to, but it was ended prematurely. Ron was also written up in the July 2006 issue of Chicago Magazine. All completely different in their personalities and contributions to chess, but contributions nevertheless. I was a sad observer to this man’s demise. I was biking along the lake just after he was pulled from the water. There was no rip current. He couldn’t have been swept into the water as waves were not a factor at the time. Thanks Steve for your eye witness account. However, this is the story they have given as the cause for several victims who were corralled on the same day. Perhaps there was a rip current earlier and not at the time of retrieving his body (1:45pm). We also don’t know how long he was in the lake before he was pulled out. Could have been minutes… could have been one hour… or more. From what I understand, he gets out there at around 11:00am. Hopefully we will get more information pending an investigation. We may never know the full truth, but we do know that he was a great guy. I have found more information on the case. It was simply a case of accidental drowning. There are no timelines given. Why he jumped in… there are some plausible theories floating around, but I will continue to search for more information. Witnesses say the man jumped in the lake, and started calling for help when did not resurface for several minutes. At 2 p.m., lifeguards attempted to rescue 61-year-old Ronald Washington, a former collegiate hoopster and self-described chess “hustler” who for years had been a fixture near the beach. Washington, of the 100 block of West Maple Street, was fully clothed when a lifeguard pulled him from the water near 1400 N. Lake Shore Drive, according to police and park district spokespeople. Washington was pronounced dead at 4:30 p.m. at Northwestern Hospital. The 12-year old girl (Aiyanna Patterson) who was pulled under by a rip current died this morning. After reviewing the articles presented. My belief on what happened was, that likely jumped in to bathe or enjoy the water and possible the current overtook him. I have never heard of this happening but based on the other reports it appears to be a factor. Yes… and rip currents are not necessarily amidst violent waves. It is merely a shift in current where water is going in different directions. He sure was a pleasent fellow and a true character he will be missed. Ron, was a good friend, although I did not frequent the north side to much when I was active in the chess community Ron and I HAD SOME VERY INTERESTING GAMES,He was the first chess player of status to congratulate me when I became an expert, He was very skilled and we played in rotation with a few other strong expert level players, Ron was a true fixture in the chess community, God bless him and his family at this time! I knew Ron Washington very well. Before I left for the East coast in the mid-80’s I played him in a tournament game. I had the black pieces and he played the Reti. He eventually used the long black diagonal to mate me. He was a mid-level expert at the time. I saw him often when he would come to the PK4 Chess Shop (Run by myself an others such as Gene Scott, Tyrone Lee and Ward and others). He was a great attacking player and took on all comers in speed chess. I am shocked to hear of his passing. Chicago has lost a tremendous chess personality. John Porter and Jose Espinosa, email when you get a chance. larryagee8851@comcast.net. Living in Atlanta now. Ron “Ronny” and I grew up on Scarborough in Louisiana. We spent many summer day playing basketball in his back yard. I will always remember him eating his Butternut candy bars and Hamburgers. R.I.P. my friend. I go back over 30 years when I met Ron Washington. There was a KFC restaurant on rush st. back in the 70s that I often ate but I could not help but notice a huge room above Walgreens that always stayed lit at night and I wondered what was going on in that place. One day around noon I had the courage to go upstairs. That is when I saw people playing chess and backgammon and that is when I got to meet Ron who was owner of the club. Even though I played chess I was not good at it, but was good at backgammon and Ron was my apponent in many tournaments. I remember meeting Ron on the street when he was driving cab and he gave me a free ride and we talked and talked about the good old days. I just want to say that Ron was a kind true friend and I will never ever forget him for as long as I live. Sometimes we really don’t appreciate people until something happens to them and sometimes we never miss a friend until we lose one. Its sad to hear about RON WASHINGTON’S demise. I had played him several times when I was on business in Chicago. Ron came up to me at Starbux on North Avenue in 2003 and wanted to play a game of backgammon for money. I had played as a kid and I beat him. I could not understand why he was so shocked. Little did I know that he was an excellent backgammon player. Something most chess players do not master. Anyways, the deal Ron and I worked out was, we played backgammon for money and when I won, he would give me a chess lesson. So I lost a little money and learned how to play chess. Ron was an exceptional person in that he connected with people. His personality transended race and gender. He touched me the five year period that I knew him. For example, when I met Ron I was single. He told me something that I repeat to others and I believe was good advice for a single man. “Women choose you Bobby.” I am happily married for many years and Ron was exactly right. He had many, many insights into people and a passion for life. After testing basketball and corporate America, he lived his life on his terms and I know that he went out as a happy man. He will be missed. I just learned of Ron’s death the other day. This is extremely sad. I liked Ron very much and always enjoyed his energetic company. The North Avenue Chess Pavilion will never be the same. Most people knew Ron as a great chess player, but to me he was a dear friend. Ron would visit and talk with me while I worked on projects at Starbucks. He and I grew close over the years. He was very wise and gave me a lot of wonderful guidance through many stages of my life (always with a hefty dose of good humor and love). He would brighten my day and I would look forward to our wonderful heart-to-heart talks. The world lost a beautiful person, and he will be sorely missed. I was just thinking about Ron today, as I played him in chess in Minneapolis when he lived here. I am saddened to read this news. He was a good chess player and a character. RIP, Ron. Yes… he passed last year. I saw him months before he passed at North Avenue. Ron taught me the Tao Te Ching. We shared lots of laughs, and a few tears.